“The early bird catches the worm,” say early adopters who feel that jumping on new tech right away gives them advantages over latecomers. “Yeah, but he doesn’t catch the worm who sleeps late,” respond those who “wait until the bugs are worked out” of anything new. There are pros and cons to caution and daring when it comes to new things, like technology. Unfortunately, a lot of people are not “a reasonably savvy Windows jockey.” They aren’t paid to be, and so most them can’t afford the time to read every technical bulletin that would help them decide which Windows updates they need and skip the rest. Most people have only one practical choice: install all important updates or install none. Installing none of the steady stream of Windows updates is a recipe for certain disaster. An unpatched system steadily deteriorates in performance, reliability, and security compared to a system that is kept updated. That’s not a prediction, it’s an indisputable fact. Waiting to see if a new batch of updates sparks a wave of complaints is only slightly better than installing no updates at all. At best, this strategy leaves your system vulnerable for a certain period of time to hackers who know where to attack, thanks to Microsoft’s worldwide announcements of vulnerabilities and patches for them. At worst, you may forget to install those critical updates “later.” And let's face it -- you'll probably forget most of the time, if you try to manage it on your own. The fact is, there is more to lose than there is to gain by adopting a “wait and see, then do it yourself” approach to Windows updates. Early this week, Microsoft pushed out 13 security patches via Windows Update. Six were rated Critical and seven of them were rated Important. Several of them affect ALL versions of the Windows operating system, and could allow an attacker to gain full control of an affected system. If you're running Windows Update on auto-pilot, your system was patched automatically. If you're managing things yourself, how long do you think you should wait before applying those patches? If you happen to be among the VERY few users who are affected by a botched update, it’s not going to destroy your computer - or your credit rating, as identity theft enabled by an unpatched vulnerability may do. In most cases, you can roll back the problematic update with System Restore. At worst, you’ll tear out a handful of hairs while waiting for Microsoft to issue a revised patch, and that generally takes only a few days. My advice, which I follow myself, is to enable automatic installation of “Important” Windows updates, the ones that are urgently needed to patch specific security holes. Setting Windows Update to automatically install “recommended” updates with important ones is optional. The benefit is automatic improvements in performance; the downside is more opportunity for an update to go horribly wrong. Recommended updates do not address security issues. If you don’t want the “Get Windows 10 Now” nagware and the 4GB Windows 10 installation package to show up on your system uninvited, turn off automatic installation of Recommended updates. If you encounter a specific performance issue (e. g. mouse is behaving erratically), check the available Recommended updates for one that addresses that issue and install it manually. Click the Start button, type Windows Update, and press Enter. Next, click the Change settings link. Tweak your settings as decribed above, and you're done. Moving away from Windows XP doesn't have to put a dent in your wallet. In my article A Free Windows XP Alternative, you'll learn about Ubuntu Linux, a free operating system that can replace Windows XP. You can even try it out without replacing your existing system. It’s one thing to be cautious about installing updates and quite another to be reckless about clinging to obsolete, no longer supported versions of Windows. Incredibly, nearly 11% of Windows machines are still running Windows XP, and another 1.62% are running Vista. These people are driving on bald tires, endangering themselves and every computer with which theirs come into contact. No, your 14 year-old operating system is not “good enough” and it doesn’t matter if you think you’ve never caught a virus. It’s just a matter of time until your clunker becomes a bot in some cybercrooks’ harem of malware-distributing, spam-spewing zombies, and you won’t even know what harm you’re doing to the rest of us. Remember those 13 security vulnerabilities that Microsoft patched this week? Are any of those flaws, which could allow an attacker to "take control of an affected system... install programs; view, change, or delete data; or create new accounts with full user rights" being fixed in Windows XP? No. Could a Windows XP user be duped into opening a document, or clicking on an email attachment, which exploits one of these unpatched vulnerabilities? Yes. I am relieved and gratified to note that only 6.67% of visitors to AskBobRankin.com are running XP or Vista, according to Google Analytics, about half the rate in the general population. But I would really like to see a zero in that statistics field. The bottom line here is that keeping your software up to date is more important than ever. I urge all readers on Windows 7, 8 and 10 to check Windows Update settings, and make sure that it says "Install updates automatically" in the "Important updates" section. You do so by clicking the Start button, then typing Windows Update. Most recent comments on "[YES!] You Really Need Windows Auto-Update"
Back to the topic at hand --- I still keep my Update settings at Notify but, do not download or install. I am one, who happens to keep things up to date. I just do NOT want the downloading of Win 10's upgrade!!! I have upgraded twice and went back to Win & Pro, after a week of Win 10. I hate Win 10. I can't play most of my Casual Games and other programs that are a part of my daily routine. I doubt, that I will ever get another PC. I am really getting too old, to start a new learning curve. Please, I can do what I do, very effectively with Win 7 Pro and it is good until 2020, probably in April 2020. April seems to be the routine 'cut off' month, for support of older Windows OSs. Now, I make the settings for my Anti-Virus program, my Anti-Malware program and several of my Utility programs, to 'automatic' update programs and databases. Now, this makes sense to me, as well as updating MS Windows 7,8,8.1 and 10. Bob, to all your readers who disagree with you (I don't know why they waste their time) and HATE Microsoft and Windows, why do they have it, whatever version? Why don't they move to another all-knowing, all-wise, all-safe, never-failing, always-reliable, never-needing-updating Operating System? Because one does not exist. I'm too busy to spend all my time fooling with my PC. I just want the thing to turn on when I need it and to WORK. Granted, sometimes it doesn't. THAT's why I follow you. I'm not saying that you are infallible (only God is that), but you have definitely helped me over the past two decades and I appreciate it. I'm fully automatic updates. I have windows notify me, I go through the update list to make sure they haven't snuck that windows 10 updater back into the important/or managed to bring it back after I told it to go hide, THEN I install the updates. Just tired of things I don't want put on MY computer. If they paid for it, fine but they didn't. My money, my choice. I don't hate Windows per se: I guess I use Win7 because it was conveniently installed on this refurbished pc; but I do despise Microsoft’s deviously underhanded recent tactics over Win10. I find it difficult to forgive Microsoft their covert SPAMMING of several bulky Win10 system files: unwittingly downloaded by most Win7 users as "Win7 updates". This Win10 SPAMMING caused my system to grind almost to a halt several times; until I changed the settings to “inform of updates” only. The previous update setting of “download but don’t install” had led to massive slowdown in my pc. The downloaded files kept preparing to self-install; then stopping at the “don’t install” instruction. This process loop repeated endlessly; until I wiped the Win-update folder – clearing all those bulky UNSOLICITED (SPAM) Win10 downloads. Win10 files are not updates to Win7 systems, and should not be PUSHED as such!! Please understand I will decide when I install Win10; the so-called "UPGRADE" from Win7&8. It would be useful to know how to distinguish necessary (security) Win7 updates, from the Win10 files which are NOT necessary until we are ready to upgrade to Win10? Why does no-one publish a list of non-Win10-loaded updates; so we can make an informed choice? A second refurbished Win7 pc; which I had also recently acquired, and set up for my nonagenarian Dad; ended up completely crashed and corrupted. This wasn’t directly due to the errant Win10 files; although the slowing of the pc certainly triggered a series of events... Dad was duped by a scam phone caller, claiming to be from BT or Microsoft, who offered to speed up his computer. He knows little about computers; but because the Win-updates prepare-to-install/don’t install loop had slowed the machine so much; Dad allowed the scammer to take control! The AVG antivirus, Malwarebytes, and AdvancedSystemCare, which I’d so recently set up for him, were all uninstalled; and several pernicious trojan-type programs were downloaded and installed in their place. Thankfully, Dad has not used online banking, or credit-card payments: so the scammers will find very little use, for any information gleaned during their hour’s deviantly criminal work! I don’t believe my Dad would have been drawn into that scammer’s ‘phone conversation; if the pc had continued to work at normal speed; the way I had set it up just a few days before. The endless repeats of the failed-installation of downloaded (SPAM) Win10 files effectively hijacked Dad’s pc. After these experiences, I surely CANNOT be expected to trust Microsoft to behave reasonably ever again; but I suppose, unless I find and research a viable alternative, I will likely have to use Win10 at some future time; despite my spouse’s negative reports on the Win10 she uses at work. Meanwhile, I am dismayed by Microsoft’s attitude to corporate tax in the countries where they do their actual profit-making business. This also applies to eBay’s, Google’s, and many other multinational companies’ obscenely cash-focussed doctrines. I just heard that Cadbury’s new American owners pay NO TAX on the multi-millions of profits from sales here in the UK either. SUCH TAX EVASIONS ARE ANTI-SOCIAL: WE MUST ALL SPEAK OUT AGAINST THEM!! Great article Bob! Very important for everyone to understand! Thanks and keep it up! I would like to know why my computer has to wake at 2am the day after getting updates installed. Why is this necessary? I too really loved Win XP but there was a point when I needed to go with the times. After a brief spell with Windows 7 ( really good also ) I skipped 8 and 8.1 and signed up as a Windows Insider to get the Technical Preview for Win 10 though it did not have a name in those days. I loved it from the very start. Better than XP and Win 7 by far. Update History shows 6 failed and 2 canceled. Installed updates lists all 8 items (by number). Maybe these 8 needed reboot to finish installing--and maybe History shows failed until the reboot---and maybe History never updates? I'm trying to avoid Windows 10 from being installed on my laptop again since it was a mess to fix since my laptop isn't compatible with Windows 10 and I lost some of my files from the automatic update. 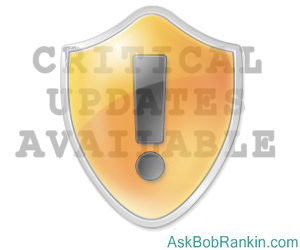 Some Windows 10 components have been listed as critical updates. How do I prevent my computer from trying to install Windows 10 again? I'm being burdoned again with message that it is in my best interest to update to Windows 10. I had automatic updates disabled after I had an endless loop from a failed update since last March and had to stop it and now had my laptop upgraded without my permission to Windows 10 that from my best understanding was initiated when I tried to install what was labeled as a critical KB update that didn't mention that it was upgrading my system to Windows 10. Bob, I followed your advise. For unknown reasons I didn't received notifications from MS. Therefore 52 important security updates needed to be installed. I did. However, two failed to be installed whatever I tried. My hard disk had been loaded by additional 5 GB. Running my cleaning software later 750 privacy issues, 2.6 GB Junk and 84 registry errors detected. I may have missed your mentioning it, but your comments do not apply to any user win 10. If you have Win 10 Home, which is probably what most do on their personal machines, you have no choice but to have MS ram the updates down your throat. Even with Pro, unless you are extremely vigilant, you will get the updates unless you never reboot your machine. I have 3 systems at home, currently, two with Win Home, and one with Pro. I have had to repeatedly conduct System Restores on each multiple times, because the updates have messed up printer drivers, removed my ability to rename any folder, past or new, etc. Microsoft's response is to let the update occur, then remove it using Programs and Features, and then hide it using their hide tool. With the number of updates, and not knowing which one is causing the problem, this becomes impractical. My objective with my computer is to use it to get work done, not to spend time to get it to work. Last week this happened while travelling in an area where I had lousy internet connection, and the upgrade did something that gave me error messages that I was missing some network protocols which kept me from accessing the internet! As a result, I am in the process of removing Win 10 from ALL 3 machines, and replacing it with either the old Win 7 or 8 that was originally on it. One last rant. IN MY OPINION, Apple does not sell you a system. They effectively rent it to you, but still maintain control over it in terms of the degree of changes you can make. They are effective in this as they strictly control how non-Apple software and hardware interacts with the OS. Microsoft, which, IN MY OPINION, allowed you to pretty much do what you wanted, is trying to emulate Apple in this regard, but it does not operate in the same controlled environment, resulting in a mess reminiscent of the old device and resource conflicts prevalent in the 80s. This is MY computer, Mr. Nadella, and you need to ask my permission before you run willy-nilly all over it, particularly when you haven't figured out how to do so. The ultimate arrogance is to say that Win 7 will not work on the new chips, given that it is still the last customer-respectful OS that MS put out. Bob, I have been following your recommendation. For unknown reason I didn't receive the notification about updates of Windows 7. I ended up with 52 important security updates and installed them. Whatever I tried 2 updates couldn't be installed. However, overall 5 GB of my hard disk had been used for these updates. Afterwards I have been running my cleaning program and 750 privacy issues, 84 registry errors and 2.6 GB junk files had to be removed. I agree with a lot of commenters’ that W7 Pro is a great platform. I had W7 Pro before W10 Pro “upgrade” and do miss the cleaner look and feel. On one system that was running XP that I chose to install W7 Pro, I ran into the problem of the update process not completing or causing problems. I did not install W7 early in the W7 cycle so that there were more than 60 updates. My mistake was that initially I chose automatic updates to W7 without regard to timing of those updates. My solution to resolve the failed update problem was to download all updates without installing them, and then manually select each update by date order (oldest first). This procedure was very time consuming but in the end all updates were applied and the system was up to date. I had contacted MS to see if there was a download of W7 with all updates included; nope. My Win10 is set on automatic updates but when the update is attempted, it reaches about 54% and then attempts to restart. After several loops of this, a message appears that Windows was unable to complete the update and changes are being reversed--do not turn off computer. When a re-start is finally completed and I check update status, it shows that my machine is up to date and no update is needed. This means each time I cut on computer, it takes about 5 to 10 minutes to start. Any suggestions? I have Windows 10 Pro, version 1511. I "Click the Start button, type Windows Update, and press Enter" but do not see a Change Settings link. I have Win10, and have discovered there is no option to stop automatic update. I currently have a problem- whenever I start up the computer, the machine tries unsuccessfully to update, then restarts, then undoes the changes, then restarts, the whole process takes about 20 minutes or so. I checked out the chat rooms, and others are having the same problems, but I saw no solutions offered, just a lot of mumbo-jumbo that was waaay over my head. Do you know if Microsoft is going to fix this, or will I just have to leave my computer on all the time? I agree with you about Windows XP, but Windows Vista's lifecycle end of extended support date is April 11, 2017. My computer will continue to receive automatic updates until that date, so I am NOT endangering myself and every computer with which I come into contact with. Why do people listen to this fool? I have no such problems with Windows 10. Do you know why? BECAUSE WINDOWS UPDATES ARE TURNED THE F OFF. Wake up morons, how many times are you going to be screwed before you realize idiots like this paid microsoft shills. EDITOR'S NOTE: Hey Yu... can you help me contact the Microsoft accounts payable department? I've been sending Shill Bills for years, and they're not paying my invoices!